In December, the City of Atlanta – Mayor’s Office of Cultural Affairs’ Public Art team completed restoration of “Niki” by Pavlos Kougioumtzis. The abstract statue was a gift from Athens, Greece to Atlanta in commemoration of the 1996 Centennial Summer Olympics. The sculpture consists of three bronze pieces resting on a triangular marble base and depicts Nike, the winged Goddess of speed, strength, and victory from Greek mythology. A sister sculpture resides at the International Olympic Academy in Olympia, Greece. Since the centennial games, versions of the sculpture have been bestowed to Olympic host cities around the world. The 11-foot-tall sculpture was assessed for treatment by Mayor’s Office of Cultural Affairs (OCA) on November 2, 2018, and was immediately prioritized for treatment due to significant base instability and a safety concern. Although the sculpture was securely attached to its concrete base, the statue’s marble veneers were unstable with substantial gaps between the top panel and the sides. With the support from Jalal Slade, Senior Policy Advisor for the Department of Enterprise Assets Management, and Maurice Calhoun, City Hall’s Facilities Maintenance Manager, OCA’s conservation and maintenance manager Shannon Douglas Kimbro initiated treatment on November 29, 2018. 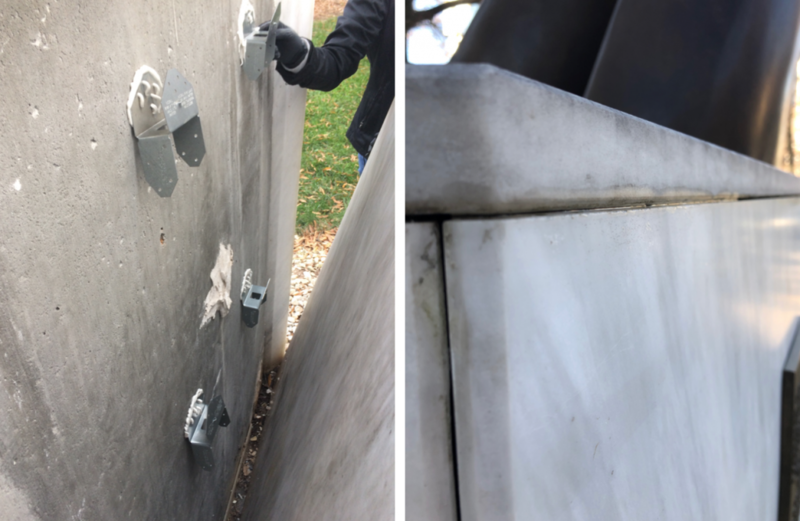 Conservation technicians, Adrian Barzaga and Addison Adams, discovered the extent of the damage while removing the caulking when one of the statue’s marble veneer panels immediately dislodged. The team re-engineered the marble veneer system by adding multiple points of contact with a construction-grade adhesive and galvanized steel connectors designed to reinforce the varying gaps between the concrete base and marble veneer panels. 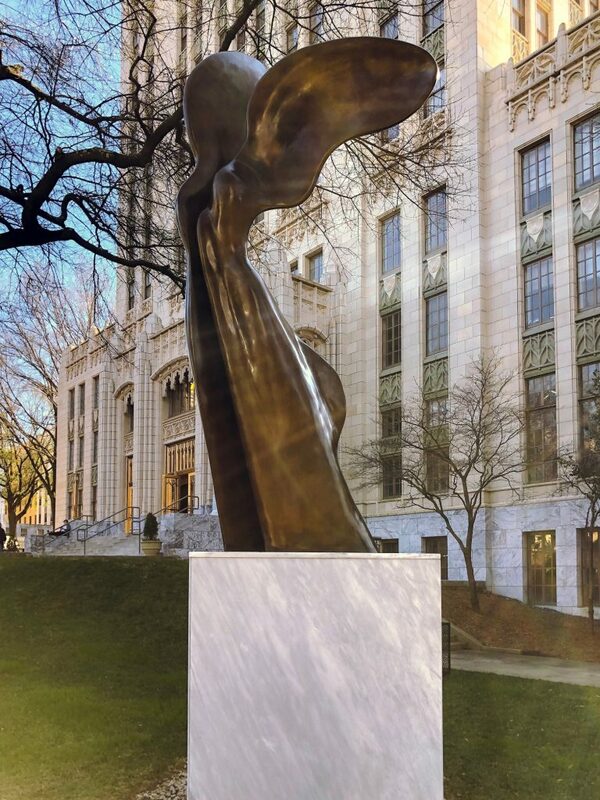 For additional support, silicone caulking was used to provide a long-lasting, flexible, and weather-proof seal while the top marble panel was sanded to remove embedded dirt to improve adhesion. After this initial treatment, the sculpture was washed and waxed. The sculpture will receive final treatments in the final weeks of 2018. To learn more about this artwork and other pieces in the City’s Collection, visit our ART Hub to explore the City’s collection.